Learn the Spanish urban self-defence method created by Justo Diéguez with just one aim in mind: Personal Growth through the development of the Instinct. 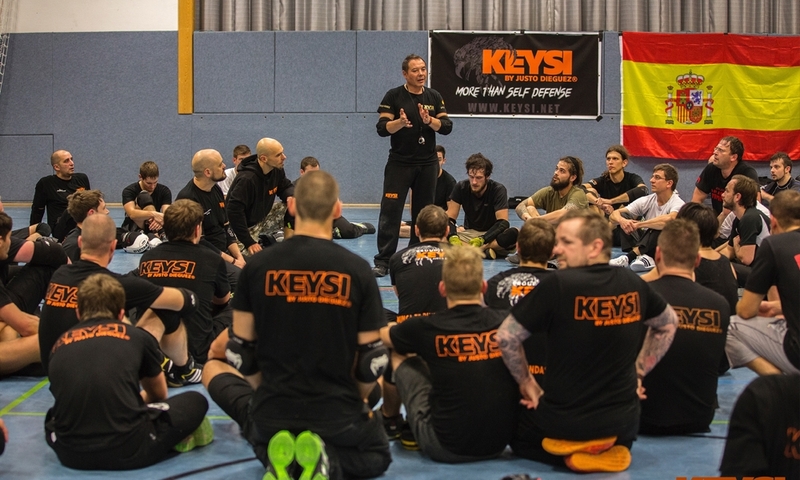 The movements, concepts and principles use in Keysi follow universal laws that are not limited by any System or Style. Keysi develops Mind and Body, merging them together into a Sole Principle, providing the person with the necessary Attributes to shape and define a way of life centered on personal growth. If there is something that differs markedly Keysi by Justo Dieguez from any martial art, it is its Principles, which educate us through Values and they give us skills for Expression and Self-Realisation in Emotions/Mind/Body. Transform Physical, Mental and Emotional weaknesses into Skills. Purpose, Respect, Patience, Persistence and Perspective. Change the lives of people so that they believe in themselves, and inspire them to never give up. The most important thing we are going to teach you is to have a Purpose, where you will discover your Physical, Mental and Emotional limits. With respect to your physical limits, you will discover your abilities and weaknesses. With respect to your Mental and Emotional Limits, this is the domain in which you will go from believing that you are limited, to discovering that your potential is unlimited. A methodology directed at you, the Future Instructor, in which you must learn not only with your memory or intelligence, but also as a constantly evolving human being, with all your limitations and capabilities. In this way, you will come to know the “How”, “Why”, “Where” and “Where To” at each moment of your development in Keysi by Justo Dieguez. You will learn how to be a Teacher and how to teach. For this we will give you a structured approach based on knowledge, experience and success. Only in a structured way can we properly transmit the motivation to grow every day to our students. Privacy (required): I Agree Legal & Data Protection Notice.